Hutch SUP Wear is a home grown stand up paddle boarding apparel brand with a super enthusiastic paddler at its helm in the form of Simon Hutchinson. We caught up with Mr Hutch to get the lowdown on ‘living a life in balance’ and all things Hutch. It’s my wife’s fault! We lived near London for a while before she had the idea of living by the sea. I had always been a dry land athlete… rugby (my passion) marathon running and cycling but now the sea was there & I had to get involved. I’d dabbled with sailing but was entirely hooked by stand up paddle from the off. After a lot of false starts I’d finally found my replacement for rugby. I was on holiday in France near Montpelier when I saw a lean and laid back Frenchman taking a surfboard off his roof rack. It got my attention as we were by the Med which is not known for its waves. He popped his board into the water, hopped onboard and paddled off with typical French coolness. This was instantly something I instantly wanted to try. My first SUP session was typically English in Christchurch Harbour. It was overcast, drizzly and windy…I loved it. So many, every paddle brings something new but I can’t forget the time I saw my first seal (in the Solent). Spending time in Portugal with my collaborator from Algarve SUP Nick Robinson, was another highlight, SUPing lakes, caves and waves. Producing the SUPfm podcast with Nick introduced me to some incredible personalities so I’ve got to say Chase Kosterlitz or Kai Lenny…both are super nice guys. The highlight though was the privilege of talking to Charlie Howden who had the most amazing strength and fortitude to set off on his journey down the coast of Costa Rica despite battling a terminal illness. He was someone special. It’s still rugby, I played it for 35 years and miss it terribly but when it takes you more than a week to recover from a match, it’s about time to give it up and do something different. When did you start Hutch SUP Wear and who’s on the Hutch team? I started the company a couple of years ago after a beach barbecue and a few beers sparked the creative process (as they tend to do). We’ve signed up Tati Coco and Will Littleboy as our brand ambassadors and are looking to add to our product team as we go. I couldn’t have started it without the support and encouragement of my wife, family and friends. Particular thanks to Al Bryant who has been my schemer in chief. What made you set up a SUP apparel company? I wanted to wear something which looks good and celebrates this vibrant new sport. I also believe that SUP is an inclusive sport and membership of this new tribe should be broadcasted: we should definitely be out and proud. I was also fed up with the surf clothing which is mass produced and turns to sandpaper after a couple of washes. From the start Hutch has always been about quality, lasting, practical products, with all the right environmental and responsible trading principles behind it. Talk us through your day to day responsibilities – is it all paddling, paddling, paddling or do you have to do some work occasionally? I wish it was all paddling; I don’t get out as much as I’d like but always go out early on a Friday morning wherever I find myself. Daily responsibilities include web work, graphic design, social media, alongside sourcing the clothing and putting the Hutch spin on it. Definitely. People are far more aware of the sport more are trying it and that’s when they get hooked. It’s a lifestyle choice and something that people aspire to. It helps that it’s so addictive and so good for your mind and body too. This is still an emerging sport and there is still huge growth to come. Tell us about how you plan on developing the Hutch brand in the UK – what are your plans to evolve? Organic growth through word of mouth and hitting events. The best feedback is when people buy one thing and then come straight back and buy more. It’s a great compliment to our quality and ethos. We are also looking to grow by selectively expanding our network of stockists alongside our online growth. What’s your most popular garment? Why do you think that is? For men I’d say my boardies have been the biggest seller: they are simple, practical and very comfortable. Ladies tees have been a great success this year too and we’ve struggled to keep them in stock. Give us your thoughts on SUP kit in general – you must have spotted certain trends? There is no hiding place for any kind of SUP kit, it’s got to perform. More ladies are getting into the sport so we are working on a more defined range for women. Talk to us about your personal SUP quiver – what are you using and why? 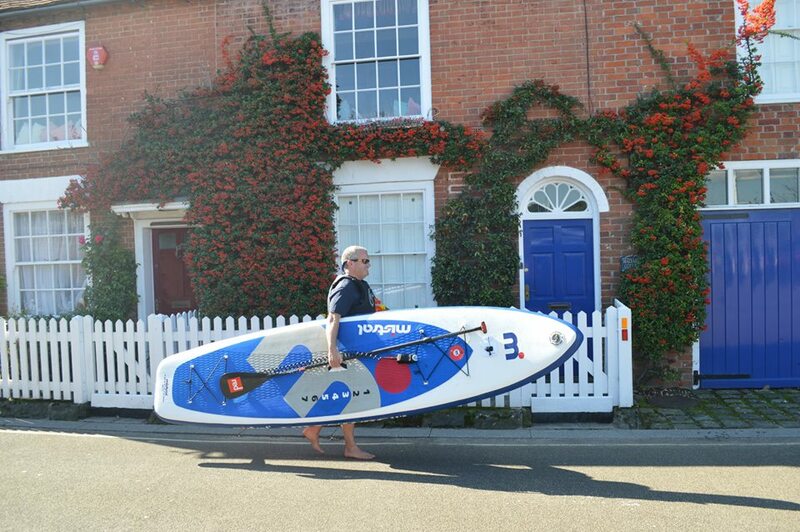 I usually drive my Mistral Adventure which I still love, but I also have a full run of my friend Sean’s SUP retail and hire business (The New Forest Paddle Sport Company, who also stock our clothing) which means Starboard all the way. Their inflatable racers are incredible machines! I live on the border of Hampshire and Dorset and we are incredible lucky here. We have the choice of the sea, lagoons or rivers to explore. Occasionally there are a few waves to play on and generally the chance of a waterside pub at some point. Any plans to hit up locations further afield – if so where you headed? This year I’m off to Sicily. Describe your dream destination – why does it appeal? Italian lakes or the NE Italian coast. It’s all about water and mountains. Anything anywhere, I’m not fussy, every session is different and I’m always happy and lucky to be anywhere on a board. When I get more time I want to spend some time developing the SUPfm Podcast with Nick. There are so many fascinating and like minded individuals out there to chat to. Any final thoughts on SUP or Hutch SUP Wear? Just a big thank you to all our customers and supporters and we look forward to seeing you out on the water this summer! Firstly big thanks to Sarah, Al, the extended Hutch family, Tati, Nick, Carys and Sean. Also shout out to Will, Venecia and the BaySUP crew; Ben and Claire; and Reuben and the team at Fatstick.